Save money and learn how to make a chai tea latte at home! A warm and spicy spiced tea blended with frothed milk for only a fraction of the price! Made in under 10 minutes. This How to Make a Chai Tea Latte post was originally published in 2012! Back then I had only one child, was still married, and, the biggest shocker of them all, I STILL DRANK COFFEE! At the end of the post, I admit that my go-to drink was a quad-soy latte and chai tea lattes were my afternoon delight. 6 years later, I can barely handle caffeine in any form so it’s herbal tea for me, please. But now that it’s fall, I have been hard-core craving chai tea lattes. Without caffeine in my life, what was a girl to do? Rooibos, my friends. The answer is Rooibos. Rooibos, or red bush tea as it is commonly called, is an herb that comes exclusively from South Africa. It has been around for the past 300 years but only recently gained popularity as a tea. Rooibos has smoky, sweet, and vanilla flavors that pair deliciously with the spices commonly associated with chai tea. Rooibos is not only delicious, but it also has many health benefits. As someone who cannot drink caffeine I find Rooibos tea the perfect alternative. HOWEVER, Chai Tea Lattes traditionally use black tea. And so, if you are looking for a caffeinated Chai Tea Latte, an unflavored black tea is the way to go. Which, you’ll be happy to know, has it’s own many health benefits. 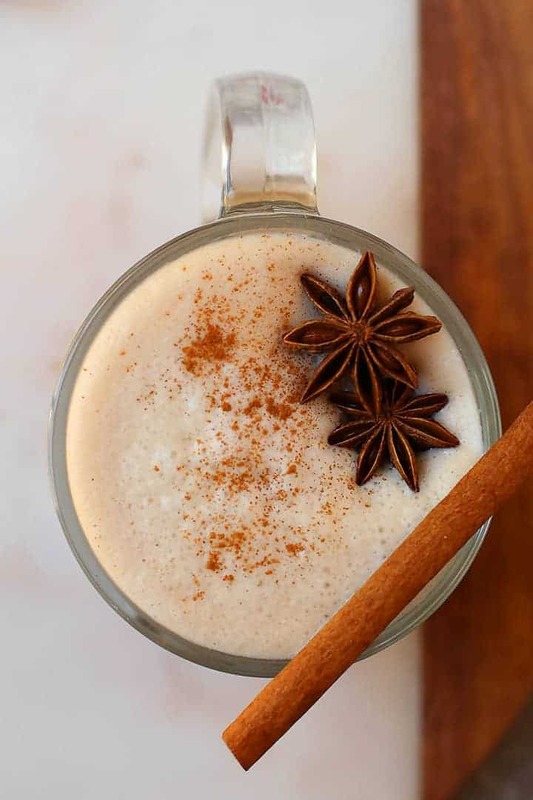 There are several ways to make homemade chai lattes. I have tried many over the years. Over time I have developed a tried and true chai tea latte that I think you will love! 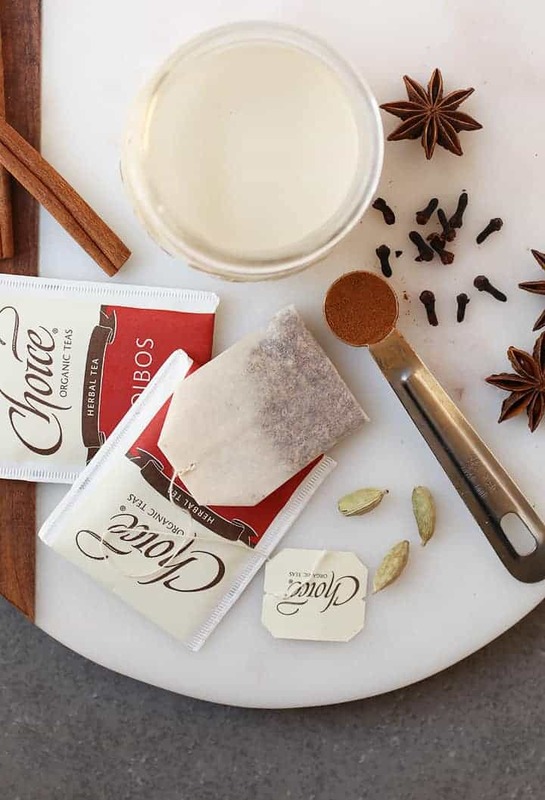 Once we’ve picked out our tea – it’s an important decision, my friends – we can start making our chai tea latte. In addition to tea, I like to use whole spices that get steeped with tea for a full flavored experience. Sometimes, I’ll also add grated ginger into my tea (just throw it in with the spices) if I’m looking for a little extra zing. The spices are very flexible in this recipe, so mix and match as you please. With your tea and spices picked out, the next step is to boil and steep them in 1 cup of water. You are essentially making a chai tea concentrate. If you know you will be drinking a lot of chai teas this fall and want to be efficient, double or triple the batch and store your chai tea concentrate in the refrigerator for up to two weeks. Once your tea and spices have steeped for 5 minutes, pour them through a fine mesh strainer so that just the concentrate remains. Step Three: Froth the Milk! Again, it’s time to make some decisions. What kind of milk goes best with your Chai Tea Latte? My preference is soy because the flavors blend well with the spices of chai. Additionally, soy milk is one of the best non-dairy milk for frothing. However, if you don’t like soy my other recommendations are hemp, cashew, or oat both for flavor and texture. To get a nice frothy foam on our milk, I heat it up to a scald, that’s just before boiling point, then transfer the milk to my frother and give it a few pumps. If you’re looking for a milk frother, this is the that I use. And it’s less than $15 on Amazon! The milk then gets poured over the concentrate, which mixes all up on its own. 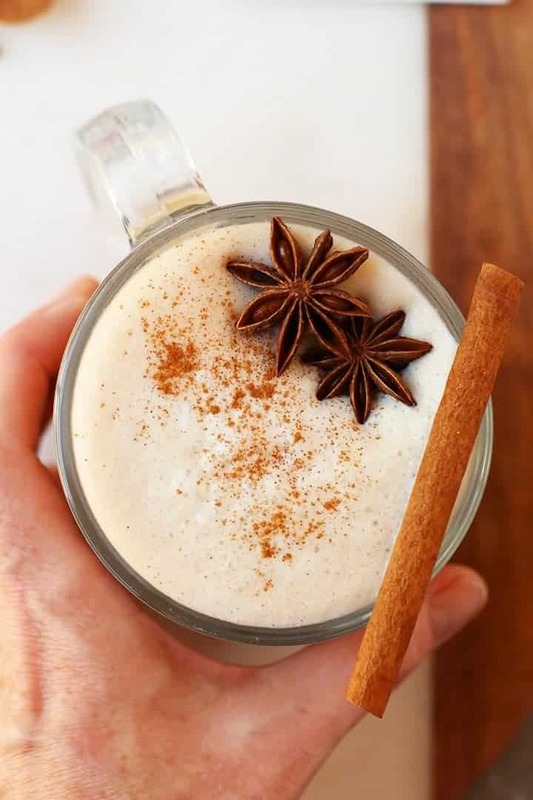 Sprinkle your lattes with a little cinnamon and top them with some star anise (because it’s so pretty!) and go on an enjoy your beautiful fall day! A great chai latte is a balance of spices. Experiment with the spices in this recipe to find the perfect combination for you. I highly recommend getting a milk frother. However, if you have a French press, those work great for frothing milk. Just pour your warm milk into the French press. Pump it up and down a few times and you’ll have delicious latte-quality frothed milk! Serve your Chai Tea Latte immediately with an oatmeal date scone or vegan blueberry muffin. 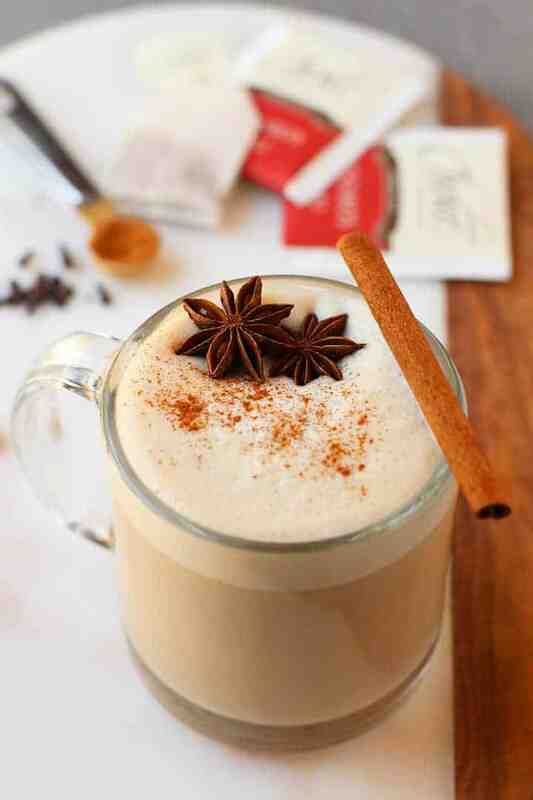 Top your vegan latte with some star anise and sprinkled cinnamon for a beautiful morning beverage. Sound good? Let’s take a look at the recipe card below. Over medium-high heat, combine the water, tea bags, and spices in a medium-sized saucepan and bring to a boil. Boil for five minutes. Remove from heat and stir in maple syrup if using. Carefully pour hot water through a strainer, dividing it equally into two mugs so that just the tea concentrate remains. In the same saucepan, bring heat milk to scald (just before boiling point) then remove from heat. 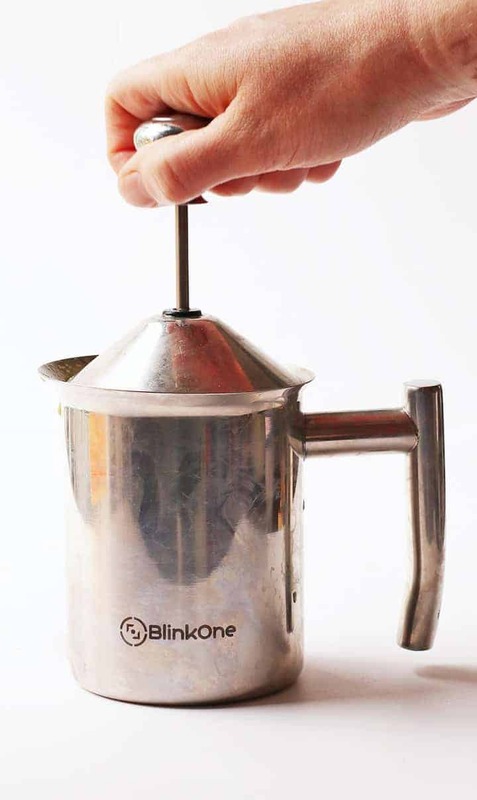 Transfer milk to your milk frother and pump up and down a few times until your milk is light a frothy. Tap the frother a few times on the counter to let the milk settle a bit. Top off each mug with milk. Sprinkle with cinnamon, garnish with a couple star anise (optional) and enjoy immediately! Black tea is traditional for Chai Lattes, however, I use Rooibos tea for an herbal, caffeine-free option. If you don't have a manual milk frother, a French Press works well. Where do you buy your tea powder from ? I just buy black tea but you can buy chai tea powder and omit the spices if you want. This is the brand I buy. Wow, This spicy chai tea latte looks yummy. And love your step by step instruction to make this at home. I will try it for sure. 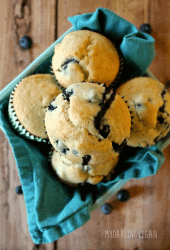 Thanks for the sharing this yummy recipe with all of us. I should start making my own blend, too! That would be much better. Yes! Finally something about chai spices. 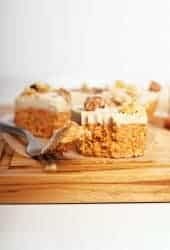 Definitely the best-sounding recipe I’ve found on line, and the one with the least amount of sugar required. I just ordered by whole nutmegs so I should have one of these in my hands later this week. Thanks! Thanks Gary! Glad you found it. I’ve never done it with a VitaMix. And since I wrote this post several years ago my french press broke. So now I can have foam again. Thanks for the tip. Hello, Sarah. Thanks for the recipe. I found it when I was doing a search about nutmeg in tea. I had read elsewhere of some bad side effects when using nutmeg. Have you ever had any concerns? I don’t want to get sick (or stoned, or have strange dreams.) Thank you very much. Not very familiar with nutmeg concerns, but I use it regularly in many recipes and have never noticed any side effects of it. Thank you. 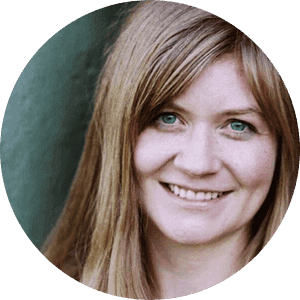 I had read (and seen reports on Youtube) of people who had had hallucinations and really strange dreams, or experiencing feelings similar to an alcoholic hangover. Your recipe looks really good, I will try this. Thanks again. This is delicious! I make it in a large batch then mix it with the milk when I’m ready to drink. I use a little less cinnamon and I tad bit more all natural (not bleached) sugar. Perfect!!! Love your pictures! Thanks for the recipe. I just started making chai tea, due to high cost of coffee shops and store bought chai. I only have ground spices other than cloves and peppercorns, so making use of what I have on hand and it works perfect. Nice treat on a cold winter morning! 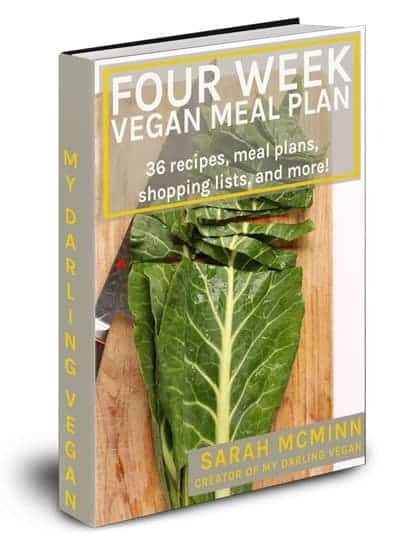 Hi Sarah…………your site is great. Thanks. Question regarding this chai (I drink chai daily)……1 whole nutmeg? I mean, 1 whole nutmeg seems overly potent? 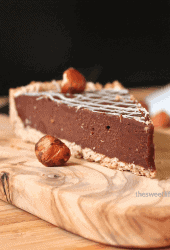 1 whole nutmeg lasts me months….do you reuse it? thanks. Hey I’m glad you mentioned that. I do reuse my whole spices, especially the cinnamon sticks and nutmeg. I will go back and make a note of that in my post. Thanks for catching that! yummy! 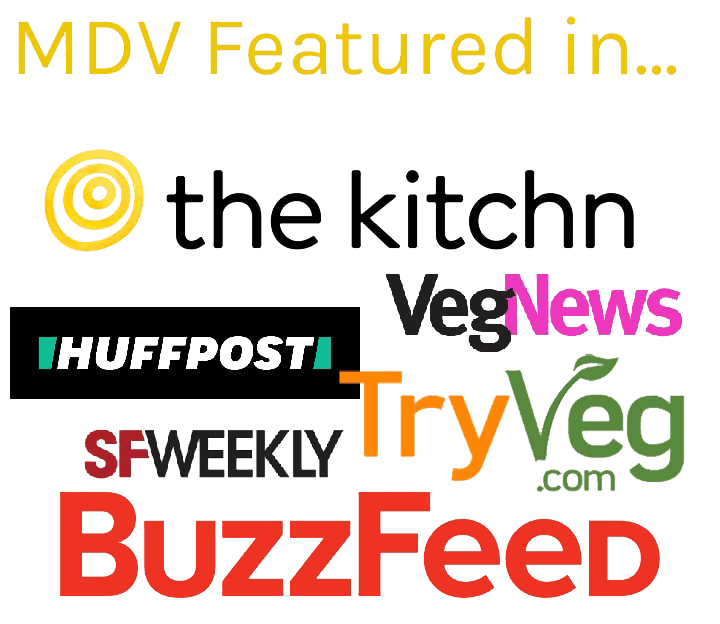 i am looking for a veg chia recipe. so glad that i stumbled upon this. I made this and it is soooo good. I love this blog. I have a (probably dumb) question re the spice mixture – what do I do with the whole spices such as the cardamom pods and nutmeg? Hull and grate the nutmeg, and crush the cardamom, etc., or just use them as is? Thanks! Hey Therese, I just put the spices in whole and let them simmer in the milk long enough to flavor the chai. You could however crush them for a stronger flavor and since you’ll be straining the milk it doesn’t matter how the spices go in. Enjoy! This looks much better than my soy chai tea latte! I use Stevia, vanilla soy milk (frothed) and cinnamon. That’s it! Gotta’ try yours! I love making my own chai tea lattes at home! I do like the ones from coffee shops, but they can sometimes be too sweet. Like you said we have more control over sweetness and spiciness if we make it ourselves. Also, thanks for sharing that milk frothing technique. I never thought of using my French press to froth milk. I learned about that technique several years ago and now I use it all the time. It’s especially good for hot chocolate. And I hear you about some coffee house chai being too sweet. It’s always safer to make it at home. Chai is one of my all time favorites! yummy! And so beautiful pictures!! !